The evenings are finally getting lighter, and Spring is within a finger tips reach. Although, it’s still pretty cold, and a few people have had some snow… so far, it’s not reached us! This month, I’ve been battling those confidence demons again and I wanted to touch on this subject again, as I know many fellow equestrians also suffer with a similar battle. In the learn more section we are going to look at Showmanship Classes. These last few weeks, I’ve felt my confidence take a bit of a drop. I wasn’t sure why, as nothing has really happened for it to suddenly crash. Toby has been a little spookier, but I think this is brought on by me over thinking situations. And not being that confident, firm rider, I have been the last few months. I spoke with my trainer about it and together we looked at what could be causing it. I then remembered, it was the 6-year anniversary of a bad fall I suffered from a friend’s horse. The horse bolted and proceeded to jump out of the arena with me still aboard. Catapulting me out of the saddle and ending up in a heap on a concrete floor. I had badly jarred my lower back, but thankfully only muscles had been damaged. It was still enough to keep me out of the saddle for 8 weeks. During those 8 weeks my mind began to play tricks on me. I would constantly play the incident around my head over and over again, thinking about how it could have ended. I honestly believe subconsciously my brain had remembered this anniversary. Although I hadn’t been thinking about it, it was having an effect on my confidence and was slowly destroying it. I mentioned this to my trainer, and he agreed this is where this blip has arisen from. He told me that when he goes to a certain venue & show, where he had a bad fall and broke his arm. He would start over thinking the incident and it would play on his mind. Theses previous experiences are things that need to be addressed and move on from, rather than burying the memory. It isn’t always easy, and I’ve found learning NLP and CBT tactics really helps. Although the weather is cold and sometimes wet, we are making the most of the nicer days and trying to get back into hacking. Over the winter months, because I see to Toby in the evenings, it’s always too dark to go for a hack round the paddocks and fields, so most of our time is spent in the arena. The weather at the weekend was sunny and bright and a perfect day to get back into hacking. I made sure I wrapped up warm and we headed out, tracking it all on Huufe as we went. It made a lovely change to training in the arena and although Toby was a little bit “looky” at some tuffs of grass he managed to cope fine. We did have one spook at an invisible monster in the trees. I was able to correct him by dis-engaging him and getting him to refocus on me. He definitely enjoyed his walk out, and now the evenings are getting lighter, we are able to squeeze in a quick hack after work. I am now starting to get Toby ready for the coming season, not only physically, with his training, but also cosmetically. As you may remember, last year he had completely rubbed out his mane and tail and was near enough “hogged”. Just as we start approaching Spring, his mane is looking amazing, and I’ve even been able to give it a small trim! I still have to watch him closely as we start getting nearer to Sweet Itch season. He is also now moulting… a lot! It’s like a blizzard of white hair every time I touch him with a brush. Despite this, it’s nice to see him with a healthy coat again. Unfortunately, I had to make the hard decision to cancel our clinic in May. Due to personal circumstances. But there will be more opportunities I’m sure. In the meantime, I’ve been looking at what Western shows we can attend and take part in, and which classes will suit us. This meant looking at what more we needed to learn, so we could enter more classes. 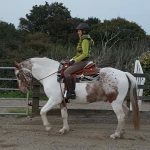 There are a variety of ridden classes we can take part in, but I wanted to look at what else there was. We then learnt how to walk off and stop together. Toby is required to stand next to me whilst keeping a good distance & personal space… so no nuzzling or nibbling! We then practiced our “set-up”. This is setting the horse up ready for the judge to inspect. Again, Toby must learn to stand dead-still and each time he moves or lifts a foot, we get penalty points. As the judge walks around the horse, its vital for the horse handler to make sure the Judge is safe at all times. If your horse was to ever try to kick or move towards the judge, you must be standing in the right place to stop this. This is done with a method called “Quartering”. the horse responds and listens to you, rather than their conformation & appearance. For example, do they walk when you walk, do they stop when you stop, do they stand quietly and still whilst the judge inspects them. We spoke with our trainer and recently had our first lesson on Showmanship. 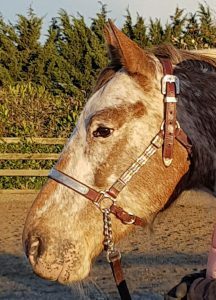 I learnt how to fit the halter and how to attach the “lead shank”. This is a leather lead with a length of chain on the end. We finished with the back-up. It was a great lesson and is something else we can now work on each day. Equine Thermoregulation – How does your horse cope?